The Contract is the core tool of governance in a free market economy. An EU Contract Law Code is now on the political agenda because all three legislative bodies in the EU and most member states favour it in principle. In its communication of July 2001, the Commission proposed three major options: to enhance the existing EC Contract Law by eliminating inconsistencies; introducing a European Code which substitutes national laws; and introducing a European code which only supplements national laws. This book achieves three things: For the first time, European academia is discussing these three options in an extensive and systematic way with pros and cons, in a transparent and systematic way, along broad lines and often also important details. The book contains the views of all protagonists from all those who really drafted the models to all those who illustrated the potential of decentralized rule-making and invented the very idea of an Optional Code. This is the first book in which the optional Code, which is the alternative most likely to come, is thoroughly analysed at all. This work also contains a full map of design possibilities. It is the executive summary of what European academia thinks of the future of European Contract Law and a European Code. 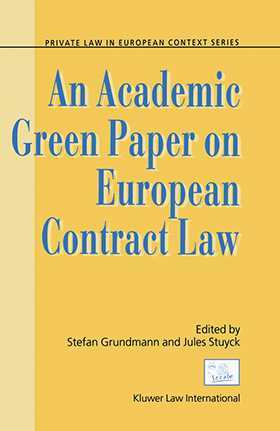 It is the Academic Green Paper on European Contract Law.